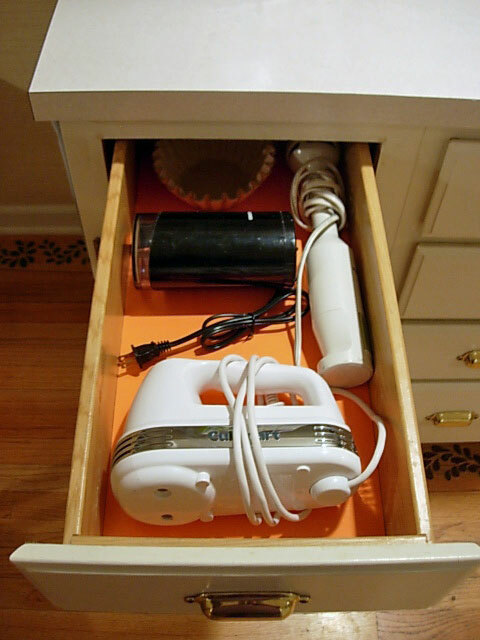 How to Organize the Drawers in Your Home With Baskets of all types. I tend to go into organizing mode when I am not in the mood to tackle a larger project around my house. As you can see from the photo below, I need to refinish my kitchen floor – it is worn in many spots. It is a big undertaking and I keep putting it off …and off …and off! …I should do it in the fall when it is cooler. …hire a contractor and just be done with it. …I’ll wait until we move. There is nothing fun about refinishing a wood floor. So while I make excuses – I have been cleaning and organizing drawers in my kitchen until I get my floor refinishing mojo back. I like change. Organizing lets me have change without costing me a thing. Making what you already own look fresh and new simply by sorting, purging, and adding order can be very therapeutic. Making it look stylish and pretty helps too. I think that is why organizing and de-cluttering is a popular task among home lovers. It feels like you are getting a new start with your stuff. You see it with fresh eyes. I like organizing my stuff in baskets. I have posted about my love of baskets before and showed you a few ways I use them. I have found most of them at the thrift store and yard sales – a few I have had since I was a teenager. When I shop the thrift store – square and rectangular baskets are the first thing I search for. I have never paid more than $1.oo for any of them. I soak them in the sink with some dish detergent when I get home and then set them out in the sun. When they are dry, they come inside and become drawer organizers. I am not a big coffee drinker, but I do “love me” some hot tea – all kinds, except green tea, which gives me an instant headache. When the teabags are placed in a low sided, square basket – I have no trouble finding exactly the type I am in the mood for. This basket is one of my faves. I have three others just like it. I have had them for a very long time. They work perfectly in drawers because they are square and the sides go straight up. Round baskets and baskets that have angled sides don’t work as well – too much drawer space is lost since they don’t fit together. Square and rectangular baskets can be placed together like a jigsaw puzzle. As you can see in my kitchen desk drawer, even though they are all different sizes and styles – they are all square or rectangular and fit together nicely – no space is lost. I am still looking for a thin long one to place in the back left corner. I don’t overlook baskets with handles – like an Easter basket or one that has a handle on each side. If I find a square or rectangular one with straight sides and a handle, I buy it and remove the handles with a knife or pair of scissors. The handles are just woven in and once you cut it, they are easy to remove from the basket. Plasticware chaos – no more. Storing the lids on their sides in the baskets keeps it under control. Bigger baskets for larger items. Seeing the baskets when I open my drawers adds a delightful visual surprise. Everything in order and in its place – aaahhhhh! It is nice not having to rummage through to find anything. I have even been known to line some of my drawers with colorful paper when baskets are not needed. This gives you a dose of color therapy every time you open the drawer. These baskets are a bit bigger and are my favorite baskets in my house. I found one at TJMaxx and when I brought it home and realized that it fit perfectly into these shelves, I had to find more. Every time I went back to the store, I searched until I had 6 to fill the shelves. It took about 9 months of searching, but I was determined and successful. I store cookie cutters in a few of them and candles in the rest. I made the French Enameled Tags for them. In the pantry I have a set of IKEA baskets on the top shelf and many other types of baskets on the floor. In my studioffice, I stack and store paper in them. If you Don’t Have Baskets to Organize Your Drawers, Try These? How about…cutting the bottom from cereal boxes and fitting them together in a drawer or use your larger square or rectangular plastic containers that you would normally use to hold leftovers in your fridge. I know some brands of pre-sliced lunchmeat come in rectangular shapes. Shoe boxes work well, too. The next time you get into an organizing mood, before you go out and buy something to help you with the task – look around your house first to see what you can find to get your small stuff in stylish order. Baskets work for me; you may be surprised with what you find – cardboard, wood or metal boxes – do you have any of these? Good Morning I am new to your Blog and can’t get enough. I am a senior citizen in the process of downsizing from 7000 sq feet to 2000 sq feet. So many large furniture pieces. I have been a crafter and Cardmaker for over 15 years. I have been wanting to repurpose some of the TV Armoir’s and cabinets for my new craft room. Do you find the chalk paint better than the rustoleum. This would be my first furniture painting project. A fellow crafter feels I should just do Ikea. I would love any suggestions. Repurposing an old TV armoire is a great way to make one organized spot for your craft room, but it would take time and effort not only to paint it, but to refit the inside to work as you want. A piece from IKEA has to be put together which takes work also, but may have better storage spaces inside. As far as painting it, it all depends on the look you want. I love the look of chalk paint with a clear wax finish. The finish looks like it came from the factory instead of a painted piece of furniture. If you simply want to change the color so it goes with your color scheme, any kind of paint will work. If using Rustoleum, you will need to sand, apply a bonding primer and then paint with a semi-gloss paint. If using chalk paint you need to sand to rough up the surface a little, paint with chalk paint, seal with clear or dark wax or you can also seal with water-based polyurethane. If you have never used chalk paint before and you want to use wax to seal it, know that it does take some time and elbow grease to get the wax to a sheen. Many apply it to thick, thinking more is better, but it is best to only apply a very thin layer and then buff with a soft lint free cloth. If more protection is needed, apply another thin layer of wax and buff again. Thanks for reading my blog – Best wishes for many happy years in your new smaller home. I love your style too, but I just went to Targèt today and spent almost $100 on big and little plastic bucket-things… I like woven baskets better since they have an organic appeal. So while I was shopping, I saw these baskets that were made of plastic, but woven like real baskets! So anyway, I’m making 2019 all about organizing, even if it is mostly plastic! Being organized but running out of baskets, so using boxes. Love the ideas, we have limited spaces, resources, so more less recycle. It takes planning, it does help much with a person who multi-task. Your posts make me happy. I am Soooo happy that someone else uses the bottoms of cereal, cracker, shoe boxes etc. I have been using them for years and my family just laughs at me. Of course, I wasn’t clever enough to cover them and will get right to that. Also, in the re purposing line, I also save a few plastic “bags” that the cereal comes in. They come in handy for food storage, pack lunches, etc. Thanks again for your clever ideas. Love your page! Awesome ideas. This is one of the most inspiring posts I’ve landed on from Pinterest in a long time! Wonderful! thank you for showing that it is possible to organise your stuff with natural products, repurposed packaging and things from the thrift store. No need to go out and buy all those plastic containers at all! Lovely post. Love this. I’ve always had baskets and won’t part with them..now I know why. Love your ideas for organizing and making it look pretty. I really love all the organizing ideas by incorporating baskets. I think I will try it out! I love that it’s a very easy and cheap way to become organized. You can also touch up any of the baskets by decorating them in your own styles. Thanks for the great tips! Your organization tips are great, I think of trying the basket idea and make a storage in my kitchen for utensils, bowls and small pans. My cleaners suggested the same and I will most certainly try it out when I have time to organize at home. I love your use of baskets. Very nice and so neat. Love your blog, I learn so much from you. You have inspired me AGAIN. And I won’t say how bad I am at procrastinating, cause I have so many things I need to repair, do over, paint, clean, organize. you are a woman after my own heart :) i love opening drawers and cabinets that look beautiful like that! What a great post! I LOVE organizing! These are all great ideas. Thanks for sharing. And, I love your kitchen, so sleek! Love this post and love organizing with baskets. My mother makes handmade baskets that are just gorgeous and I have them all over my house. 1. Love the idea of using square baskets- will have to hit the thrift store for those next! 2. You are a tea lover! I am too! I have a whole pinterest board dedicated to my tea drinking addiction. And a whole drawer in my pantry of my teas…can never have too much loose tea! I love all your ideas,amazing site.